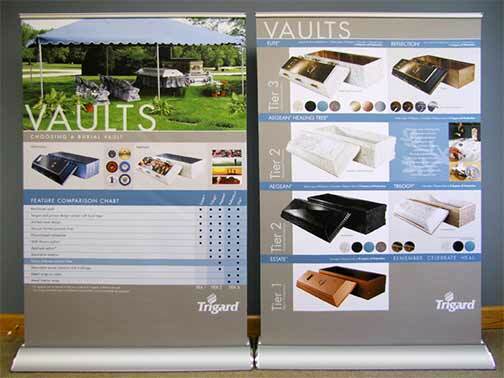 When Dave Lamontagne, Lamontagne Vaults, Massachusetts, requested a custom appliqué, he was excited to see what Trigard's creative team would design. Working together with Dave and the family, our designers found the right images to tell the story of the life being celebrated. Nice work, Dave. Are you providing your families with custom appliqués? Call Lamontagne Vault at 508-476-0040 to learn more about our applique options. Are you planning an open house or attending a convention in the near future? Did you know we loan our portable tabletop displays to our network of dealers for such events? Our updated tabletop displays feature large graphics and images, and are designed to help you sell better. Call Lamontagne Vault at 508-476-0040 to learn more. We always enjoy hearing good news and success stories. Send your updates to marketing@trigard.com and you may find yourself in our eNewsletter! © 2016 Lamontagne Burial Vaults, Inc. All Right Reserved.